A three-alarm fire claimed two lives at 282 Hanover Street, early Wednesday morning in Boston’s North End. 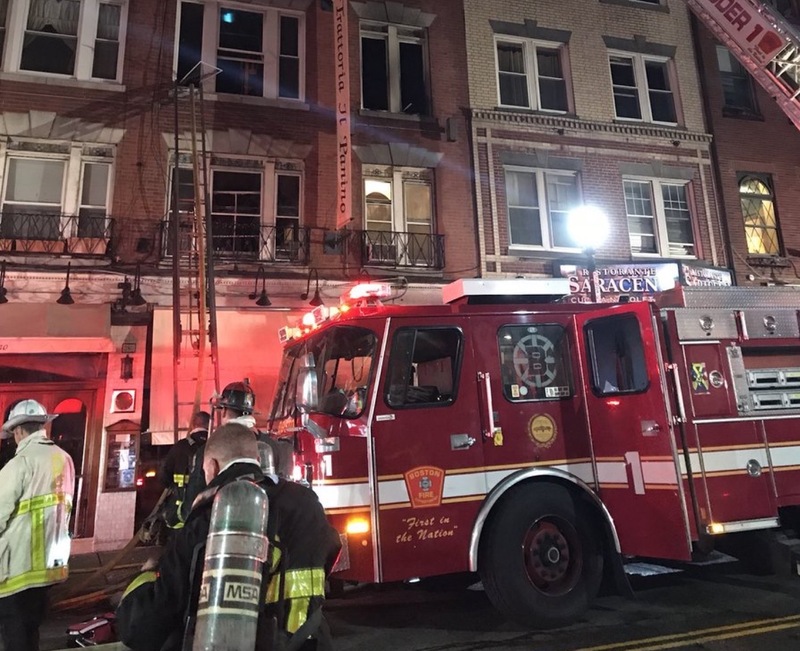 Boston Fire Department said they responded about 1:00 a.m. to flames coming out the windows at the five story building, near the Parmenter St. intersection. The ground floor is occupied by Trattoria Il Panino (formerly Caffe Pompei), Connah Store and Ristorante Saraceno with apartments in the upper floors. One man died in the building while a second jumped and succumbed to his injuries shortly thereafter. Three other residents were transported to the hospital but are expected to survive. The two deaths on the day before Thanksgiving are the first fire-related fatalities of 2017, according to Boston Fire. The cause of the fire was attributed to the careless disposal of smoking material in a second floor bedroom with damage estimated at $1.5 million dollars. After squashing the fire, Boston Fire cleared the street about 5:30 a.m. on Wednesday. Shown below are the Boston Fire Dept. tweets and photos from the overnight scene. Response at 1am to 282 Hanover St. North End for a building fire on floor 3 of a 5 story brick attached building. Restaurant floor 1, apts floors 2-5. Update on the 3 alarm fire on Hanover St. The adult male transported to the hospital has succumbed to his injuries. In addition, there is one fatality in the building. These are the first fire fatalities in Boston this year. Update from Hanover St. Estimate 12 people displaced. @RedCrossMA on scene to assist them along with Mayor’s Office Neighborhood Services. @ISDBoston Building Inspector also on scene. Investigators have determined cause of the fatal 3 alarm 282 Hanover St fire to be the careless disposal of smoking material in a 2nd floor bedroom. Damage estimated at $1.5 million dollars. Fire companies clearing scene with building turned over to owner. Tragic. Everyone should regularly think about how he or she would exit his or her building in a similar situation. Be safe everyone. Test your smoke detectors, too. to the victims & families. Why is smoking still allowed anywhere indoors? Smoking is considered a personal freedom. As a landlord, you could restrict smoking on your property, but trying to evict someone for smoking in your appartment is very difficult. Depends a lot on the judge, but most won’t throw someone out for smoking. I don’t think there are any states having laws that restrict smoking in private places, but curoiusly, almost all restrict smoking in public places. Curious, that this doesn’t apply to multi-family dwellings, but again, I think there are legal issues. Single town laws that try to have no smoking bans, have the.law struck down in court. I have had this issue in our condos. Smoking, in one case extremely absurd level, and have had no success. Public health arguements carry no weight. I found that I can spend money on lawyers and they will take the money. But there are legal arguements both ways. The truth is that I have found no legal options. There was one case in Massachusetts that was successful in lower courts, but struck down on appeal. Smoking inside in a non public place is an issue that won’t go away. The best chance of success is to address from the state lavel. But that is a real long road and only a remote possibility. Chris….an uncontrollable situation. People smoke. No Smoking signs have no power. I hear that tenants still smoke in senior housing…how bad is that? Thank God the truck had easy access to building. Very sad about the fatalities. There is a history behind thid building. It once housed the Csfe Pompei and had a back room where the Angullo (sp.) “Family” had their meetings. The family seems to still have an ownership interest in the building. What does ownership have to do with their being a fire that was caused by not properly disposing of smoking materials ?? Did I miss any comments or discussion about fire escapes? Is there one in the building? I have not been able to spot an obvious one from the front (Hanover) or side (Parmenter) views. Why did this poor person have to resort to such a horrible choice? Mark I was wondering the same thing. I see NO indication of fire escapes anywhere on this building. How is this not the leading story? Absurd and tragic.